Measles is an acute, highly contagious viral disease capable of producing epidemics. Measles is more common in winter and spring. Although measles is usually considered a childhood disease, it can be contracted at any age. Generally, preschool children, adolescents, young adults and inadequately immunized individuals comprise the majority of measles cases in the United States. Measles is spread by direct contact with nasal or throat secretions of infected people or, less frequently, by airborne transmission. 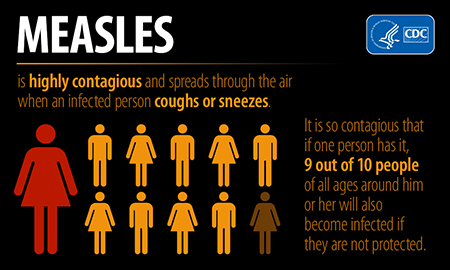 Measles is one of the most readily transmitted communicable diseases. Measles symptoms generally appear in two stages. In the first stage, the individual may have a runny nose, cough and a slight fever. The eyes may become reddened and sensitive to light while the fever consistently rises each day. The second stage begins on the third to seventh day and consists of a temperature of 103-105°F, and a red blotchy rash lasting four to seven days. The rash usually begins on the face and then spreads over the entire body. Koplik spots (little white spots with a red background) may also appear on the gums and inside of the cheeks. Early symptoms like fever usually appear 10 days after exposure (range 7-12 days) and rash appears after 14 days (range 7-21 days). An individual is able to transmit measles from four days before onset of rash and until four days after rash onset. Yes. Permanent immunity is acquired after contracting the disease. Pneumonia occurs in up to 6 percent of reported cases and accounts for 60 percent of deaths attributed to measles. Encephalitis (inflammation of the brain) may also occur. Other complications include middle ear infection and convulsions. Measles is more severe in infants and adults. Maintaining the highest level of immunization against measles is the best preventive measure. Measles vaccine (MMR) may be given at 12-15 months of age. The second dose of MMR is given at 4-6 years of age. The vaccine is highly effective and two MMR shots usually produce lifelong immunity.